Sennheiser’s TeamConnect Wireless brings to an end the age of conference call frustrations, delivering unmatched ease of use and excellent sound quality in a portable system for up to 24 participants. The TeamConnect Wireless modules - 1 master unit and 3 slaves. The essential practicality of its features – such as letting additional callers join an ongoing conference at any point by simply connecting another device, really demonstrates that we have achieved this goal. Ease of use, better sound quality and reliability: A new study by Sennheiser [Enterprise Connect booth 934] and Millward Brown reveals these to be the top three unmet demands of managers running remote conferences. Sennheiser is presenting the answer - TeamConnect Wireless, the first go anywhere, portable wireless conferencing solution. As businesses work increasingly flexibly across multiple locations and geographies, the conference call has become an essential stage for business achievement. For this fast–moving and dynamic working environment, Sennheiser’s TeamConnect Wireless brings to an end the age of conference call frustrations, delivering unmatched ease of use and excellent sound quality in a portable system for up to 24 participants. Today’s meetings can happen anywhere. With teams often spread across many locations, it’s mission-critical to successfully bring people together, because only a connected team can perform to its full potential. Yet despite this, too often conferences don’t run smoothly, hampered by technical challenges or offering poor sound quality that makes it difficult for participants to be understood. This has a direct impact on business performance: A new study by Sennheiser and Millward Brown released in January 2016 has revealed that successful companies have strong internal connections and run a higher frequency of meetings, while lower performers meet less often. The study also discovered that barriers in sound quality and usability of meeting technology leads to lower frequency of meetings, with managers demanding that future solutions should be reliable, offering better sound quality and intuitive ease of use. The stylish portable solution is made up of four units – one master and three satellites that can be easily transported in a durable, easy to transport charging case. 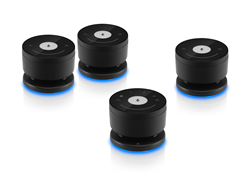 The units are wirelessly linked by a DECT connection and provide a flexible system that can be set up in virtually any room or table arrangement. TeamConnect Wireless offers peerless connectivity options, making any device immediately capable of establishing a professional quality conference call in seconds. Users can quickly connect their own Bluetooth smart device or computer wirelessly, with NFC making pairing with compatible devices simple. Wired connections are also possible via USB – ideal for web or video conferencing via a computer – or jack cable, so it can readily fit in to a broad range of hardware set-ups. The system brings a new level of usability to conferencing that makes it easy for anyone to operate with minimal instruction, freeing users from the need for technical support. Simply slide the four units from the case and they automatically power up and link together. The intuitive, touch-sensitive control panel on the master unit allows you to connect devices and control calls, while the satellite units have touch controls for muting or adjusting volume. Uniquely, TeamConnect Wireless supports multiple simultaneous audio channels, so additional callers can be joined to an existing conference by just connecting another device. Alongside leading edge functionality, TeamConnect Wireless is designed to be at home in even the most prestigious office environments. Use of premium materials such as glass and aluminium makes the system tough enough to take anywhere, while conveying unmistakeable business class elegance.